Isagenix Shake and Nourish Pack - Buy Direct in the UK! Isagenix Shake and Nourish Pack £ £134.00In stock! Order now! Ready to get on the fast-track to the Isagenix way of life and begin experiencing healthy weight loss? If so, the Isagenix Shake and Nourish Pack is for you! Featuring the three most effective weight loss products in the Isagenix arsenal, this complete cleansing and weight loss programme has everything you need to boost your health and begin shedding kilograms in no time at all. 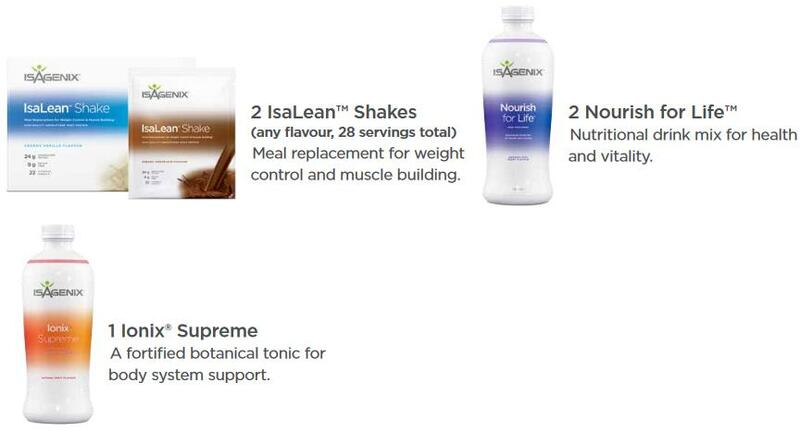 The three nutritional components of the Isagenix Shake and Nourish Pack are formulated to help you cleanse your body while infusing it with superior nutrition for healthy weight loss and optimum well-being. Improved muscle tone, and more! Want more information? Download the Shake and Nourish Pack guide here. 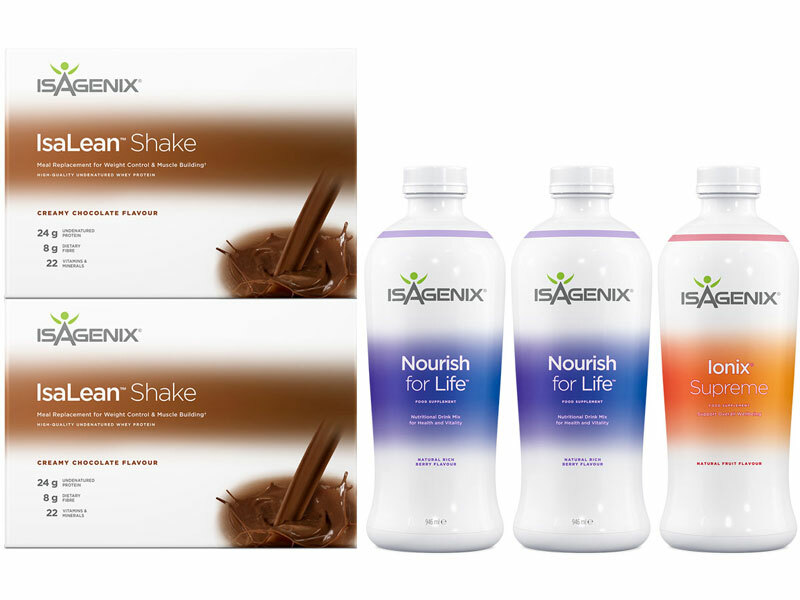 The Isagenix Shake and Nourish Pack combines premium nutrition with the age-old art of cleansing (intermittent fasting). Both components provide the body with proper nutrition for optimum health while gently cleansing it of damaging toxins and impurities. Toxins are everywhere and simply unavoidable in today’s world. They’re in the air we breathe, the water we drink, and especially in the food we eat. Unfortunately, toxins and impurities build up in the body over time. Worse yet, when they’re combined with excessive exposure to free radicals caused by modern lifestyle factors, they can even contribute to premature ageing, weight problems, and other health issues. How so, you ask? Well, years of toxin buildup in the body make the absorption of vital nutrients much more difficult, thereby making it difficult to manage weight and enjoy optimal health. Designed to tackle this all too common problem head on, the Isagenix Shake and Nourish Pack flushes out these toxins and replenishes the body with world-class nutrition to get it looking and performing like it should. IsaLean Shakes are a staple of any Isagenix programme as they provide all of the vitamins and nutrients needed by the body to thrive. In addition to satiating hunger and serving as complete meal replacements, these creamy and delicious shakes provide endless nutrients proven to help you lose weight, maintain lean muscle mass, improve your health, and take you performance to the next level. This tasty and refreshing drink nutritionally cleanses the body by boosting its ability to naturally combat toxins and impurities. Nourishing your body with endless nutrients proven to gently cleanse toxins away, Nourish for Life plays an essential role in the program. Ionix Supreme is a daily botanical tonic full of vitamins and minerals. This amazing product is formulated to support overall wellbeing and provides a boost of energy. Like most Isagenix programs, the Nourish and Shake Pack utilises both shake days and cleanse days. Before starting the program, however, two consecutive shake days are recommended to get your body primed and ready for the days ahead. On each shake day, both before and during the program, an IsaLean Shake is recommended for breakfast. You should also have a shake for lunch and a healthy 400-600 calorie meal for dinner, or vice versa. Regardless of which type of meal schedule you choose, water consumption is vital during the program. Although we live in the UK and enjoy rather cool weather, adult men should drink at least 3 litres of water and adult women should drink a minimum of 2 litres throughout the course of each shake day. Isagenix believes in the power of nutritional cleansing. However, just because you’re undertaking the nutritional cleansing programme doesn’t mean you can’t nourish your body! During the program, at least 48 hours will be spent cleansing, which involves abstaining from everything except for water, Isagenix Nourish for Life and Ionix Supreme. Staying hydrated is a must when flushing out toxins, so you’re free to drink plenty of water on cleanse days. The other products will provide your body with the right nourishment to increase the effective of each cleanse day and help boost your overall health. Isagenix recommends only cleansing for two consecutive days in a row and not performing more than two cleanse days per week. Due to the lack in calories, only light exercise should be performed. Isagenix Shake and Nourish Pack or 30 Day Weight Loss System – Which is Better? The Isagenix Shake and Nourish Pack is a great choice for those desiring results with a lower up front financial commitment. Having said that, the 30 Day Cleanse provides your body with a full month of premium nutrition and delivers long-lasting results. Both programmes are great, but the 30 Day Cleanse is by far the most popular and a better option for most, especially those who are looking for a lifestyle change and serious results. Plus, it’s great value! Regardless of which cleansing programme you choose, rest assured we’re here to help before, during, and after your cleanse to ensure you achieve your health and weight loss goals. How Much is the Shake and Nourish Pack? Preferred Customer on Autoship =£134.00 sign up fee. Sign up to the Autoship programme to have access to the cheapest wholesale prices year round and get your Isagenix programme delivered straight to your door every month. Autoship can be cancelled at any time, even after you take advantage of the cheaper prices on your first order! There are no locked in contracts of any sort. Preferred Customer =£141.00 sign up fee. You can still get access to cheaper than retail prices, however this option will cost more than signing up to the autoship programme. Customer =£170.00. No annual fee and you’ll save 10% off full retail prices. By being on autoship you’ll save an additional 5% on any pack or system. Full Retail =£188.00. If you prefer not to sign up for autoship or pay an annual fee, you can purchase the products at full retail price. Read Isagenix Shake and Nourish Pack reviews from real Isagenix UK customers!